Kratovo is located on the western slopes of the mountains of Osogovo, at an altitude of 600 meters above the sea level. It's located on 93 km from the capital Skopje and from the nearby Kumanovo, is just 53 away, while from Stip is 52 km away. The Kratovo location itself present an attraction. Kratovo is located in the crater of an extinguished volcano. The city of the bridges & towers, as Kratovo is described, is one of the oldest cities in Macedonia. Kratovo's name has been mentioned since the time of the Romans who called it Kratiskara. Exploiting the wealthy mineral treasuries and processing the gold and silver in the famous Kratovo mints as coins, the Romans left numerous traces of their presence on Kratovo area. Under the name Koritos or Koriton, the city continued its life during the Byzantine Reign. The Arabian traveler Idrizi from the 12th century mentions Kratovo by his ancient name and claims that it is one of the larger in the area. In the documents of the Byzantine ruler Alexius 3rd, from 1199, Kratovo is mentioned as "Episkopus Koriton". The golden age of it's development started in 13th century, parallel with the development of the mining. The Serbian ruler Mulitun ruled Kratovo and during his reign the German Sasa tribes settled in the mines. The gold, silver and other mineral reserves attracted the attention of the Turkish conquerors, too. When the Turkish sultan Murat, went to conquer Kosovo, his passed through Kratovo. But before the big battle for Kosovo, he prayed to Allah in an orthodox temple of St. Archangel Michael. He was killed during the battle, and his son Bajazit, who later occupied Kratovo (14th century), in his honor turned the church into a mosque. The trading of craft products, the processing of coins, and the mining continued, followed by the construction of about 20 mosques, tekes, Turkish baths (amams), fountains, medresi and impressive stone bridges. In the 19th century, there used to be 350 merchants stores, that traded with goods from Dubrovnik and Carigrad (Istanbul). The Turkish writer Evlija Čeleblija, mentions that 20 churches, 2 baths existed in the year of 1660. During the period of the Karpoš rebellion in 1689, the miners from Kratovo did stand in the line of the rebels. Additionally both of the river banks were built up amphitheatrically with two-floor houses. 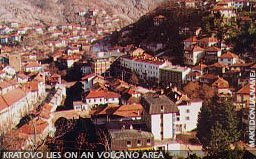 However, according to the writer Ami Bue, in 1836, Kratovo had 56,000 citizens, and only two furnaces smelters which were in a poor condition. The beautiful Kratovo, famous for its goldsmith workshops and vibrant bazaar, has started to stagnate in its development. The population naturally started to leave Kratovo, and by the end of the 19th century, there were only 1,900 Macedonians. In the vicinity of Kratovo there is the famous and well known monastery of Lesnovo in Lesnovo. Today Kratovo is a modern, typical small mountanious city. There is a shopping center Sileks. 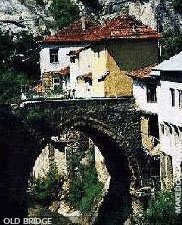 The rich cultural-historical past of Kratovo left numerous bridges and towers. Only 6 medieval towers of the city have been preserved to the present day, of total 12. The time of the construction of those towers has not been established yet, but their architectural style and the ornamentation used, indicate that those construction originate from the period of the Turkish rule. The more significant towers in Kratovo, are the Simiceva tower, Emin-Bey tower and the Hadzi-Kostova tower. The bridges which unite both parts of the city, extend as lances between the two shores of Tavacka river, and are a special feature of Kratovo.